A safe overland corridor between Iran and Syria via Iraqi Kurdistan will be a godsend for Bashar al-Assad’s regime and a nightmare for Turkey. Saleh Qallab, a renowned Jordanian journalist and former information minister, says Tehran and its Baghdad allies are actively trying to intimidate Erbil to endorse the plan. The corridor would give Iran a direct supply route to the Syrian regime and to Hezbollah in Lebanon, right up to the borders with Israel. With all that is taking place in and around Syria, keep your eye on the convergence lines of the Iraqi-Turkish-Syrian borders. Now that Assad’s regime handed control of Syria’s Kurdish areas -- including the major cities of Qamishli and al-Hasaka -- to the PKK (Kurdistan Workers’ Party), regional border clashes could break out at any time soon. Once they do, current political power balances throughout the Middle East will change. Tehran has been since 2003 harassing the Kurds in northern Iraq to give Iran an overland corridor to Syria and Hezbollah in Lebanon and the capacity to fence off southern Turkey. Massoud Barzani, the president of the Iraqi Kurdistan Region, has categorically refused to play ball. 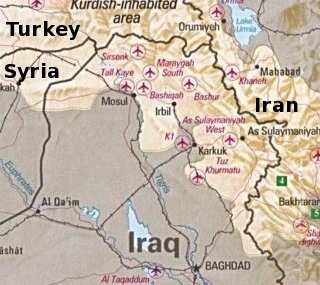 He is aware the corridor would turn Iraq into an Iranian vassal state, allow Iran to project its power throughout the Middle East and block southern Turkey’s aperture to the Arab world. Enhance his status as a stooge of Iran alongside (Iraqi Premier) Nouri al-Maliki and others in Syria, Lebanon and the rest of the Middle East. Renewed pressure on Barzani by Maliki, who last week sent thousands of Iraqi government troops to the Zumar district, where they attempted to cross Kurdish lines, push back Barzani Peshmerga forces and control the convergence lines of the Iraq-Turkey-Syria boundaries at the Ibrahim Khalil border crossing near the Khabur (Tigris) river. This puts Syrian Foreign Minister Walid al-Muallem’s visits last week to Tehran and Baghdad in perspective. Would Iran send units of its elite Revolutionary Guards to forcibly create a safe corridor to Syria through northern Iraq in collusion with Talabani? If so, could Turkey remain tightlipped and not get embroiled? Watch out for a regional free-for-all.